The most advanced DCC reference thermometer commercially available, yet still able to meet the 20ppb level, but at much higher measurement delivery rates. 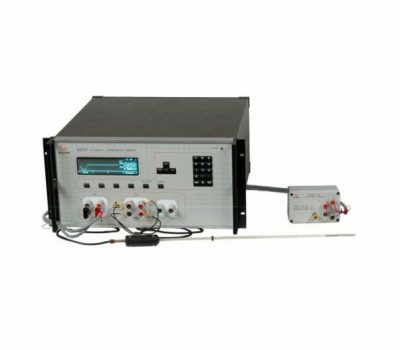 Can be fully automated and used in conjunction with our resistance standards and SPRTs to provide a complete measurement chain. The reference thermometer 6640T Series provides the best in innovations, advanced technology, and most importantly - The best in measurement performance of any reference thermometer manufactured today! 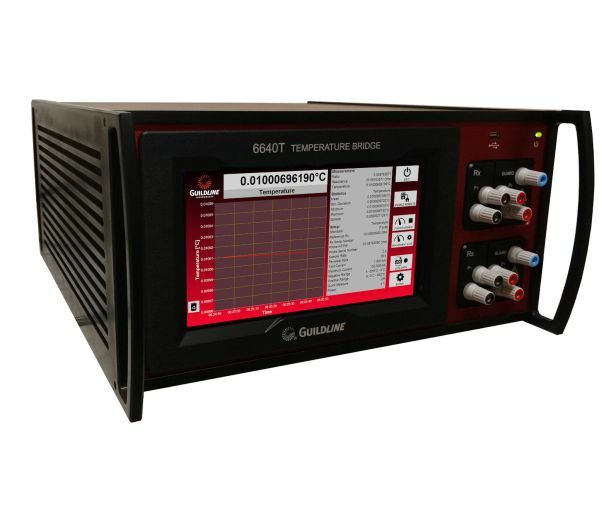 GUILDLINE’S NEW 6640T series of reference thermometers is a completely redesigned DCC Temperature Bridge to provide better uncertainties, faster measurement rates and more operational capability. The large multi-touch screen with rich graphics is the most visible feature on the 6640T Series. The 6640T Series is much more than merely a touch screen interface centered on the same old technology used for the last 20 years. It incorporates the most advanced design and best operational features, some of which are patent pending. The 6640T is based on almost 60 Years of Guildline’s experience designing and manufacturing DCC Bridges; and incorporates customer feedback from over two hundred Guildline 6622A Bridges in use at NMIs, militaries, and calibration laboratories. Inside the 6640T incorporates a new patent-pending toroid design, low current measurement improvements, new nanovolt meter used as the null detector, very fast processor, and powerful new firmware. The new Windows 10 touch screen interface makes the 6640T easy to use while providing complete functionality for measurements and addressing the requirements for 17025 Accreditation of temperature measurements.